Reducing health risks, for example smoking and exercise. Improving the quality of care to address the evidence practice gap that exists. This means ensuring that doctors treat patients in the right manner according to solid research findings. Many people work in research because of a personal experience and personal commitment. I was initially a clinician and was a superintendent of a maximum security institution however after my wife passed away I developed a real passion for health behaviour change. In research, there is a real chance to improve the quality of care that patients and the community get in the health field. Personal experience always spurs what you do. You see friends, family and colleagues with health conditions and you want them to get the best care and the best treatment. This personal commitment gives me a responsibility to do the best research I can. I want to do the highest quality research so that it is compelling and others want to act on it. I firmly believe that research provides us with an opportunity of finding out things that are possible to make a difference to quality of life and length of life. I work with a very impressive group of researchers and I hope to be able to encourage them to be strong and productive investigators into the future. Ultimately, my research dream is it make life better for community and patient outcomes through evidence based health care. 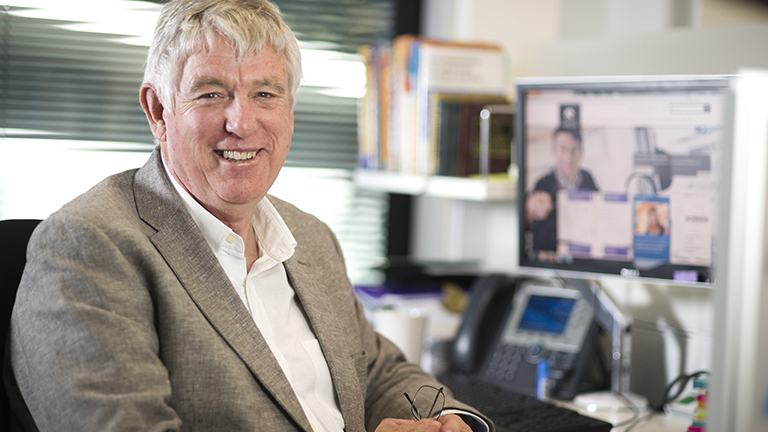 Laureate Professor Rob Sanson-Fisher AO is internationally recognised as a leader in the field of health behavioural research. His work is known for successfully combining behavioural and public health approaches to health promotion, health service models and also health service evaluation. He has published more than 400 peer-reviewed original research papers and has obtained more than $30 million in research grants, including program grants from the NHMRC and other competitive funding agencies. Recently, Professor Sanson-Fisher was awarded $3.38 million for a multicentre study to optimise communication about treatment and end-of-life care for dementia patients to improve support for both patients and their families at a time when they need it most. Professor Sanson-Fisher also has current research interests in changing health care providers’ clinical behaviour so that it more closely reflects best evidence practice. He is working to optimise the development, implementation and evaluation of health protocols and outcomes for vulnerable population groups including Indigenous Australians. Professor Sanson-Fisher and his colleagues recently completed the largest ever national trial in smoking cessation programs for pregnant Aboriginal women. He has also led two of the largest cluster randomised community trials in cancer control and reducing alcohol harm. Professor Sanson-Fisher played a significant role in establishing the World Health Organisation (WHO) Behavioural Science Group at the University of Newcastle and was previously the Dean of the Faculty of Health and Medicine at the University. He also was the Inaugural Director of the Hunter Centre for Health Advancement, Inaugural Director of the Commonwealth Government National Cancer Control Initiative, Director of the NSW Cancer Education Research Program and Director of the Mater Hospital Board. In 2000 Professor Sanson-Fisher was awarded the Hunter Medical Research Institute (HMRI) Award for Research Excellence and in 2009 he was awarded an Officer of the Order of Australia (AO) for his service in improving public health outcomes through research and education in the areas of behavioural science, cancer control and Indigenous health.